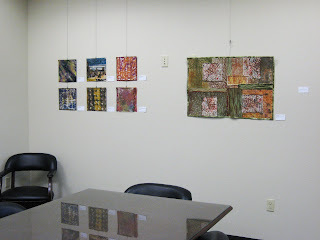 Yesterday and today, I hung my solo show at Cochrane & Associates in Eureka. 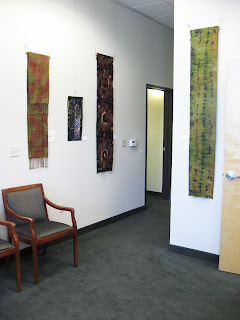 In all, I've got 36 pieces hanging -- 10 art cloth pieces and 26 quilts of varying sizes. The show runs from now through August 31. Cochrane & Associates is open weekdays from 6 am to 4 pm (they're a stock brokerage firm), and the Arts Alive! reception will be on Saturday, August 1 from 6 - 9 pm. If you're in the North Coast area, stop by and see the show anytime...and if you'd like an invitation postcard to the reception, email me with your postal mailing address. I'm really glad the show is hung so I can get back into the studio. 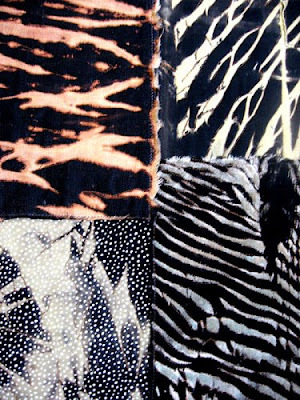 I have a new shibori quilt in the works that I'm anxious to get working on. And all that deconstructed printing I'm itching to do. I've been out in the field several times in the past few days, soaking up nature and taking lots of photos. 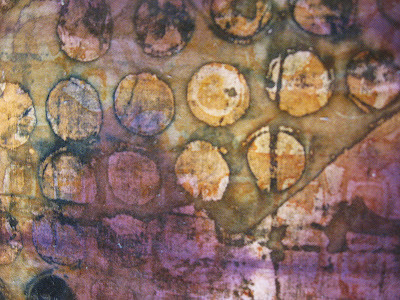 Check out Textural Images in the coming days to see where I've been! With all the other things I accomplished in the studio this week, I also printed up a storm on Thursday afternoon...the first piece is a print from the tail end of a deconstructed screen. 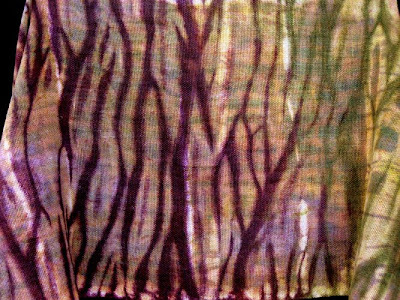 There wasn't a whole lot of image left on the screen, resulting in the relatively small amount of printed image and the overall background coloration of the fabric, as the print paste picked up color from the dried thickened dye. 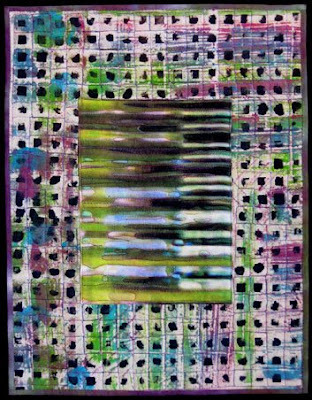 This piece was discharged recently, then printed this week with a masking tape patterned screen. 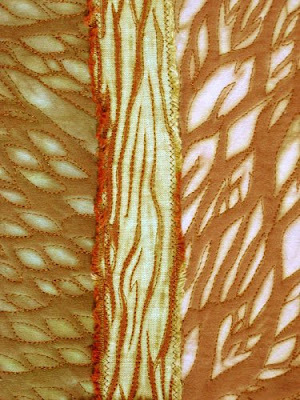 This is another deconstructed screen print -- the second go-round for this piece of fabric that had originally been shiboried once or twice. 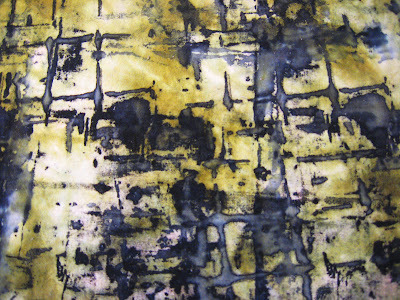 This is a print made with a glue-resisted screen, on raw silk that had had the same screen printed on it a couple months ago. Another glue resist screen print. 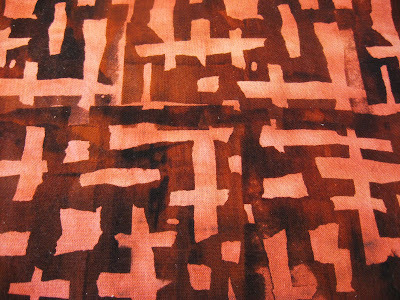 An amazing piece, this one -- deconstructed screen printed on scrunch shiboried muslin. 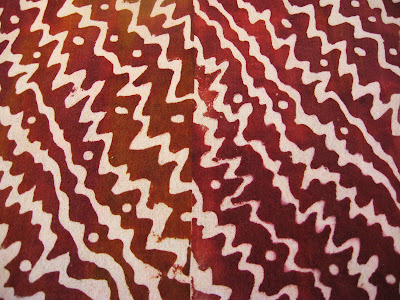 And this last piece was same as the one above -- deconstructed screen print on scrunch shiboried muslin. I particularly love the last two pieces. 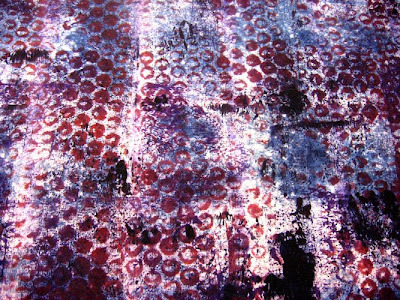 I'm moving more and more toward the abstract, serendipitious, unreproduceable fabrics. Yesterday and this morning I finished reconditioning all my silk screens, plus building a few new ones, and plan on doing a bunch more deconstructed screening in the coming week or two. 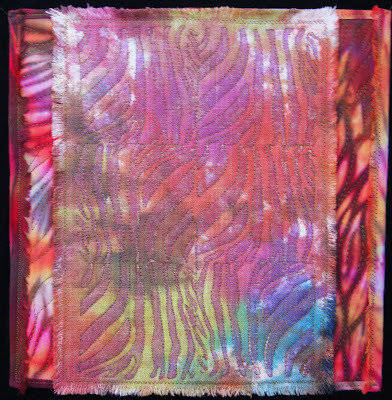 A couple of years ago I created this woven shibori scarf -- some of you may remember that I've been tinkering with it for maybe eight months now, turning it into art cloth. The piece didn't sell as it was, obviously, and I was never keen on the way it turned out, anyway. So I've been reworking it since late last year. Here's the newly finished piece, entitled Undersea. 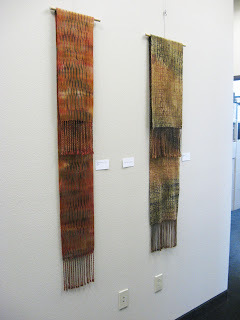 The finished size, hanging, is 46" x 11.5" and it has been newly listed at Etsy and Soleyne. 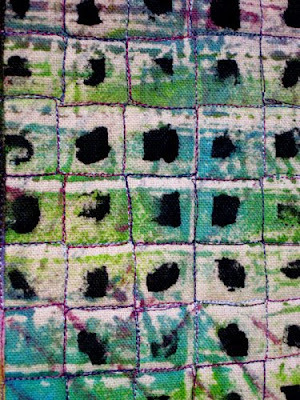 It's also going in my solo textile exhibition, which I'll hang on Monday. Boy, there's nothing like a deadline to get things finished up! Here are all the steps I took to get it from its original form into the finished piece ~ discharged, overdyed with acid dyes, discharged again, arashi shiboried twice with acid dyes, itajime shiboried with fiber reactive dyes, handpainted with Lumiere, and foiled. I'm really pleased with it. The process of reworking a piece is challenging. I'm glad that I've developed that muscle that allows me to keep working at something until it's the way it's meant to be. Earlier on in my artistic development I wasn't able to do that. Thankfully I can deal with that level of anxiety these days. I'm not really on edge, as it were, but this week's quilt is entitled Lunatic Fringe...and this is quilt number 26/52.2009. When I began this weekly challenge, I imagined what it would be like to be halfway through the year, and low and behold, we're here! 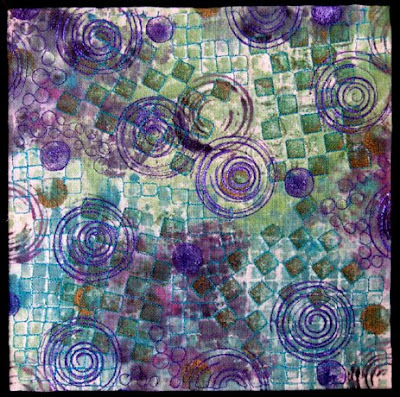 The center fabric on the quilt is cotton/rayon that I painted eons ago, and just this week I stamped it with Lumiere. 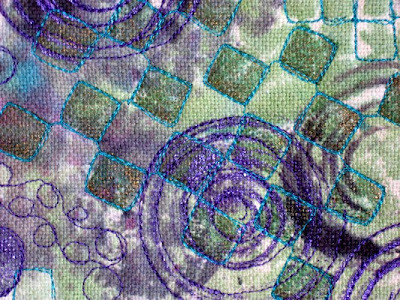 I love stamping metallic paint on fabric and then quilting the designs. I'm listening to TV from the livingroom, the reports about Michael Jackson's death today. It is so sad, his life became a tragedy, yet he was immensely talented. Rest In Peace, Michael. I am pleased to announce that I have joined Soleyne.com, the premier online gallery of fine art and craft. Soleyne is just getting off the ground, after numerous years in development, and features original, unique works by world-class artisans. I am honored to have been selected to be among the initial artists. Once you go to my shop at Soleyne, click on Browse Gallery at the top to see other artists' work. I am most excited about the fact that Soleyne promises to distinguish itself among online sellers of art by focusing on high end, high value work. Check it out, and you'll see what I mean. 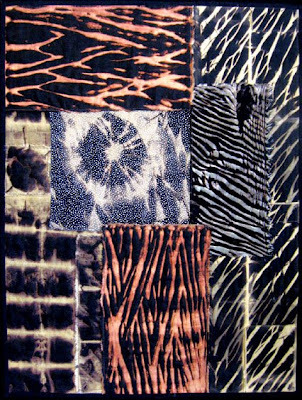 This is my latest quilt, finished over the weekend -- Discharge Series, 7. 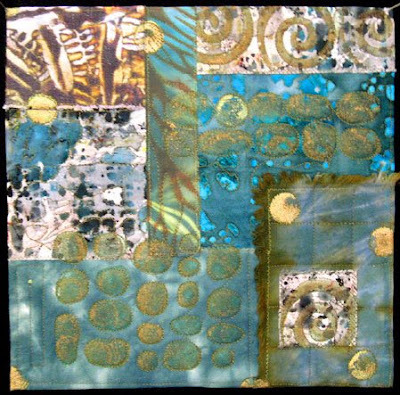 The piece is approximately 24 x 34" and includes different cottons and linen fabric. The starburst in the center was a piece of black fabric that had small white dots/spots printed on it before I discharged it. 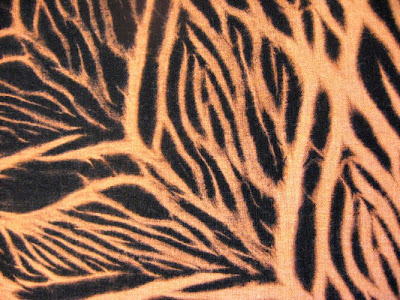 I love these discharged fabrics! This week I'm preparing for my upcoming solo show at Cochrane & Associates in Eureka. Mostly what I need to do is get the hanging rods and slats ready for each piece, and select which pieces to show. And make info labels for each piece. Likely I'll have more pieces ready than will get hung. Cochrane & Associates is a locally owned brokerage company that regularly features art by local artists, individual artists or small groups. I'll be back later -- I've got a bunch of things to do today and need to get going. Have a good one! I have been thinking about Italy lately. And this little quilt said Tuscany to me -- although it probably more brings to mind the gorgeous ceramics from Deruta, a little town in Umbria. But Deruta doesn't resonate the way Tuscany does! 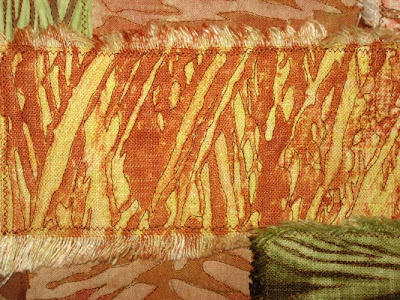 The fabrics above are numerously printed cotton and raw silk. 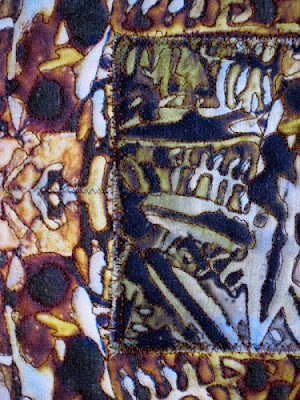 And the little piece in the center was my very first digital image transfer on fabric, before I began printing directly on cloth. I stenciled Lumiere over the transfer months ago, and the piece had been sitting in a basket for months. A new twitter friend, Lisa Sonora Beam, is leaving soon for Spain, France and Morocco, and I can't help thinking about being in wonderful places with beautiful landscapes and inspiring art everywhere. But anyway, back in Humboldt County, another misty, damp just-about-summer morning awaits my brief trek to the studio! One of the surface design techniques I did a while back and wanted to get back to is deconstructed screen printing, or DSP. 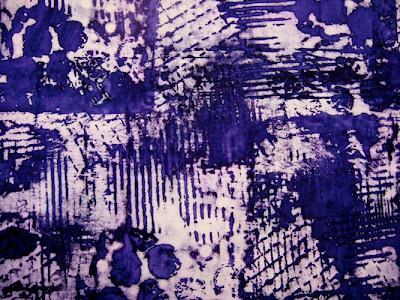 For those unfamiliar with it, DSP is basically a silk screen printing process using a screen that has been prepared beforehand with thickened dyes and objects that leave impressions in the drying dye. 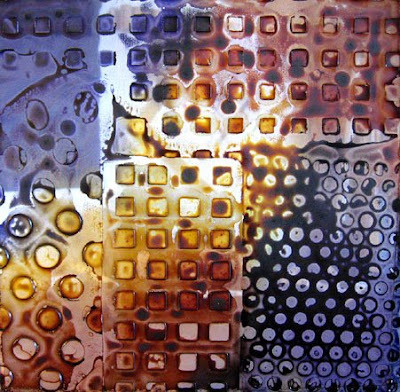 When the screen is printed with clear print paste (urea, water and sodium alginate), the dyes breakdown little by little, leaving different images on the fabric with each pass of the squeegee. It's a fascinating process and I love the serendipitious results. 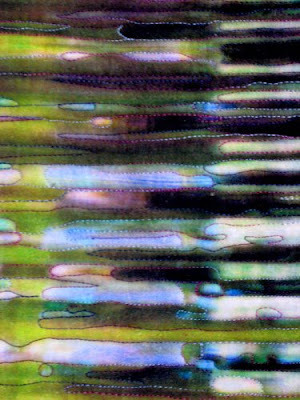 If you've been reading my blog for a while, you'll know that I love photographing the screens before printing them, and then using the digital images in various ways. 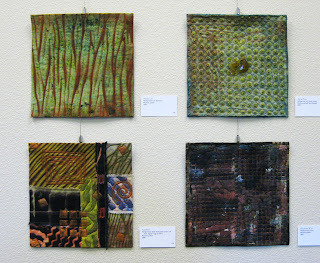 Two of my recent quilts were created with multiple images of DSP screens, printed on linen and then quilted. At any rate, the photo above is a screen I did last weekend, which I printed off on Monday. 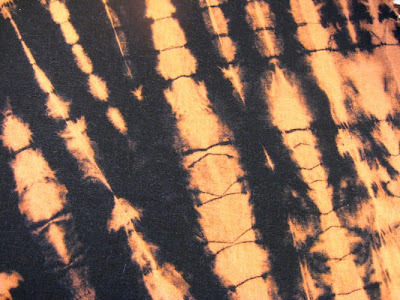 The screen looks better than the printed fabric did, because the dyes were not strong enough to leave a good amount of color on the fabric. I actually liked the resulting fabric, but decided to print over it with another screen, which I plan to do in the next few days. 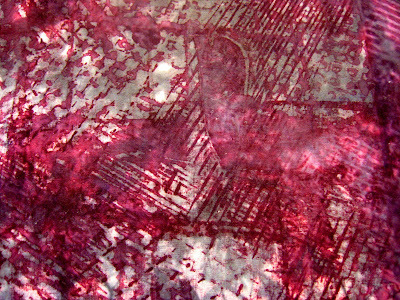 So I changed the dye strength that I'm using (thanks to dear Rayna), and the photo just below is what I printed off with another screen I made a couple days ago. I'm really happy with this and feel emboldened now to go for it with DSP. In fact, I've got three new screens ready to print! 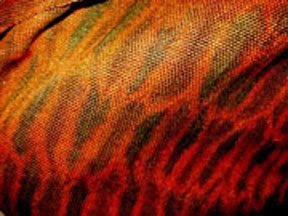 The last piece of fabric was printed multiple times although not with a screen. First I sponge printed it, then laid bubble wrap underneath the fabric and rolled thickened dye over the top as though I was making a rubbing. I love printing fabric. And I've given myself permission to throw out the dogs if there's no hope of recovery, and move on to new pieces! 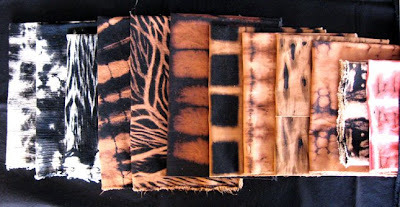 And these are the fruits of yesterday's discharge session, all done with a 20% bleach solution. The black and white samples on the left are all cotton gauze. The pinkish one on the right, closeup below, is Osnaburg cotton. The rest are all various cottons and linen (my favorite to discharge). Here's that Osnaburg cotton. With thiox, it turned greenish, with bleach it went coral. Interesting! 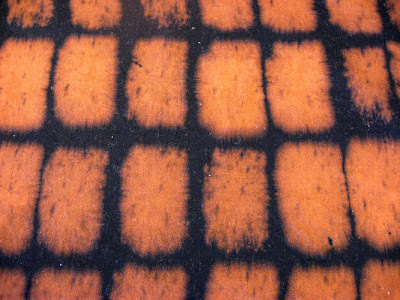 This is cotton with a new application technique. Cool, huh? I'm at home at the moment, doing paperwork and online stuff. Soon leaving to go back to the studio, for another creative day in paradise! 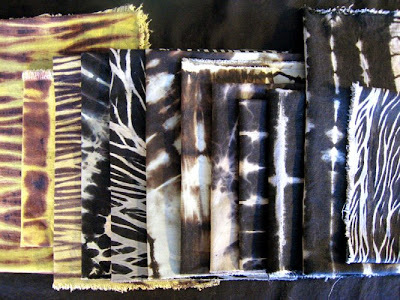 On Saturday I made a batch of discharged fabrics, using thiox on a variety of black cottons and linen. I got an amazing range of color, especially the black Osnaburg pieces on the left, which are more green than they look in this photo. 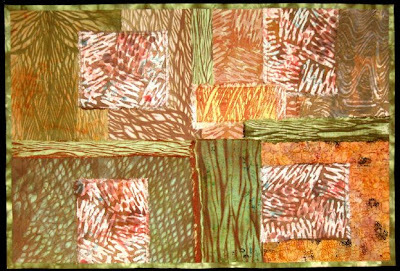 I've been creating a series of art quilts using discharged fabrics, which is why I'm keen on doing big batches now and then. If you haven't seen the finished pieces, check them out on my website, here. I've got a big one in process now, which will be number seven in the series. Today I discharged a batch of cottons and linen with a 20% bleach solution. I'll post photos of those pieces tomorrow. I also experimented -- for the umpteenth time -- with a number of bleach paste or gel products, but I can never get those things to work for me. The one bleach product that DOES work for me is Clorox Bleach Pen. At any rate, I've decided against spending any more time trying to get products to work for me that just won't -- they do work for others, so give them a try if you're inclined. But I'm finally at the point of focusing on things that DO work for me and letting the rest go. And speaking of that, I did discover some unique ways of using bleach that I want to do more with in future. And this is my weekly quilt number 24/52.2009, entitled Summer Celebration. This piece is also my June quilt. And now I am up to date on my weekly challenge! This just-finished piece is my weekly quilt, 23/52.2009 ~ Savannah, shown with the collage that provided the inspiration for the quilt. They don't look all that much alike, at this point, but the collage was the starting point. I realized this week that we're in the 24th week of the year, so I'm planning on finishing another weekly quilt this weekend -- then I'll be back on track next week, the 25th week. Can you believe that half 2009 is nearly gone?! Amazing! I've been printing a lot of fabric this week -- it's the first time I've printed in my new studio, even though I've been here for two months already. I prepared a deconstructed screen early in the week and printed it off today. 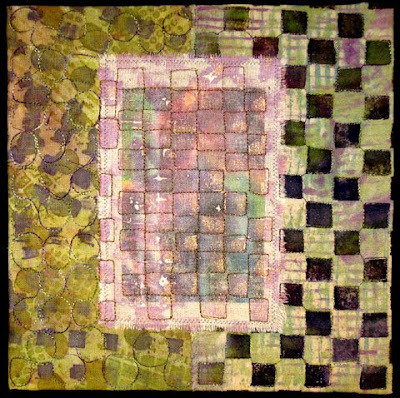 I've monoprinted, stamped, and stenciled, all with thickened fiber reactive dyes. I also did some other silk screening, with newspaper and masking tape as resists. And prepared a second deconstructed screen before finishing up today. Overall I'm not particularly enchanted with anything, but that could change when the pieces are dry and ironed. I'm still experimenting with all of these techniques, although occasionally something will turnout really well. 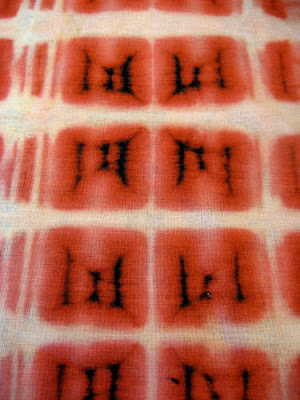 I'm far more satisfied with the shibori I've done recently than I am with the printing. But I keep working at it, and that's the important part. I have to keep reminding myself that I've only begun with all this, the work that others do that I'm really intrigued with is a result of each artist's own laborious process of developing what works for them. Anywho, I'll take some photos of the best pieces tomorrow, and upload them. Have a fruitful weekend! 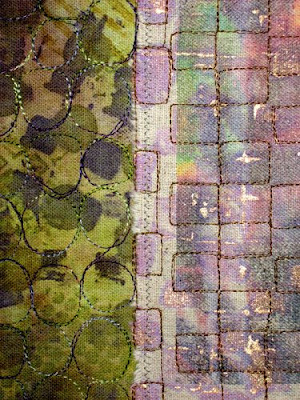 The digital image in this just-finished quilt is what started me wanting to print images on fabric to use in quilting. There's always a first, and this was it for me. I shot a photo about a year ago of a corrugated glass front cabinet in my friend's kitchen, with very intriguing reflections of the wine glasses inside. I recolored the photo in Photoshop, and used it for some of my early image transfer experiments. Here it is printed on linen fabric. And I loved the way it quilted up. 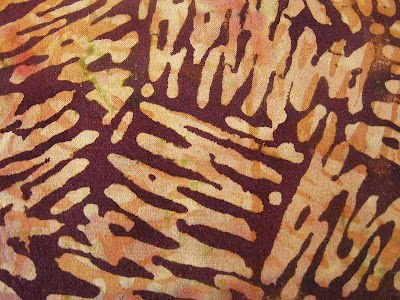 The surrounding fabric is a panel of Osnaburg homespun cotton that I printed several times with thickened dyes. And the backing/binding is a piece of shiboried muslin. 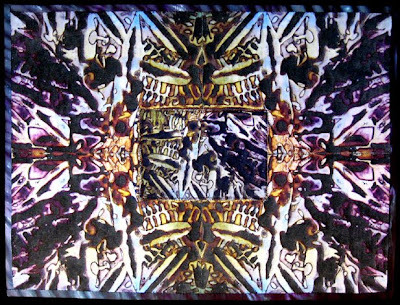 The finished piece, entitled Reflection Squared, is 19.5 by 15 inches. On Friday I neglected to post the inspiration for my weekly quilt -- it was a recent collage, shown here. 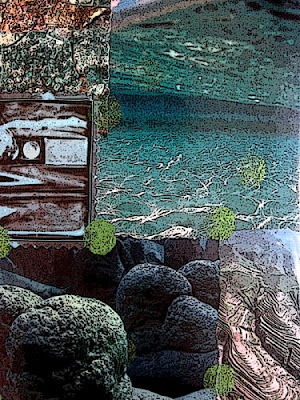 I recently posted this piece to Collage Journey, my collage blog (for those who haven't checked that out yet). 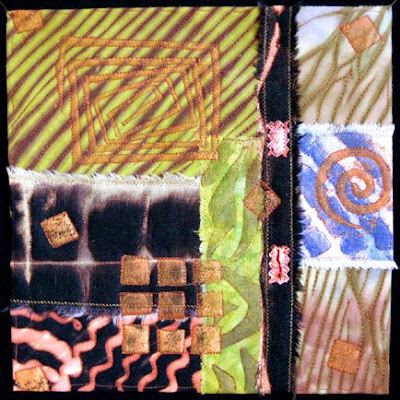 I'm already planning my personal quilting challenges for 2010, one of which will be to create fortnightly 9 x 12" collage journal quilts. 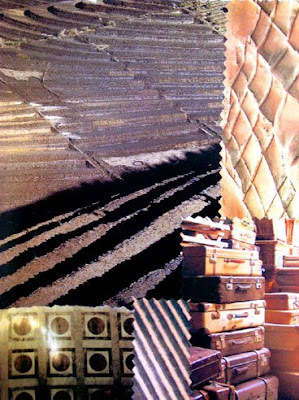 And speaking of collages, I just began Collage Journal 2, and I'm doing them daily. So I've got quite a backlog of wonderful pieces to translate into quilt art! 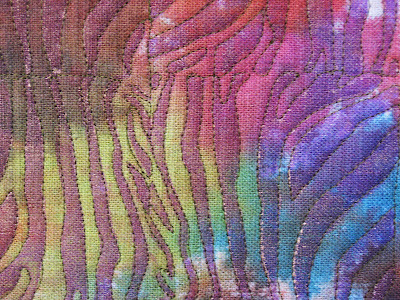 This is my weekly quilt, 22/52.2009 ~ Hidden Treasure. This quilt is a keeper to me, very special. I have the feeling that I'm on to something, with the creation of this piece. It's small, but I'm really excited about it. I'm just beginning to learn how to navigate around Twitter and I've been thinking about how it was when I first started blogging. How overwhelming it felt, but how quickly I absorbed all that I needed to know. There's something daunting, albeit mind stretching, about learning a new piece of technology. On top of that, my computer downloaded Internet Explorer 8 today, and my internet experience is just a bit different from how it was with IE 7. Oh how I dislike these changes and upgrades that you can't really get around. And to make matters even more maddening, my internet connection via Suddenlink Communications has been problematic for weeks. I lose the connection several times a day for no apparent reason. It's not my new router, it's Suddenlink. They've been out here twice thus far and still there are periodic problems. If there's no significant change in another week, we'll be going back to AT & T. I'm not relishing having to change my email address everywhere again, especially because I just did that a couple months ago. Oh, technology! Well, if that's as bad as it gets this weekend, then I'm in good shape! Have a good one! 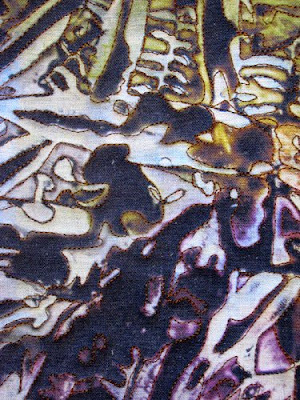 I'm thinking of calling this piece Angels & Insects, but I won't know for sure until I printed the label on fabric. The designs remind me of winged creatures -- maybe that's what I'll call it, instead! 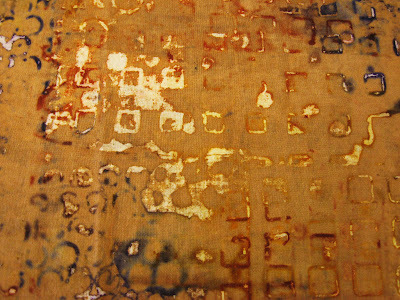 It's actually another photo I took of one of my deconstructed screens with dried thickened dye on it, before it was used to print fabric. 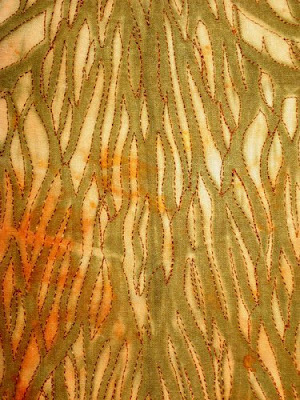 The pattern was created on the screen with fern fronds and palm leaves. I've also been finishing up a piece of art cloth, something I began months ago. 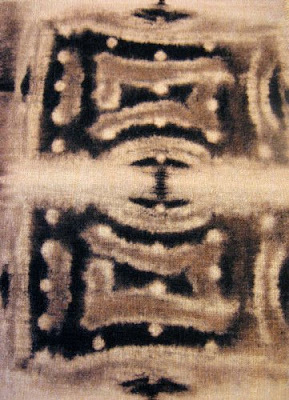 Actually eons ago, seeing as the piece used to be a handwoven shibori scarf that I subsequently didn't like. Anyhow, it is nearing completion. This is some of what I've been working on this week. Check back tomorrow to see more. p.s. I joined Twitter today, and we'll see what becomes of that. I've been so resistant to the social media phenomenon, but I'm thinking it might be a good idea to build buzz on my art. Feel free to comment about your experiences with tweeting, I'd love to hear what you have to say about it. I really enjoyed making this piece, loved the challenge of quilting all the pattern lines on the fabric. 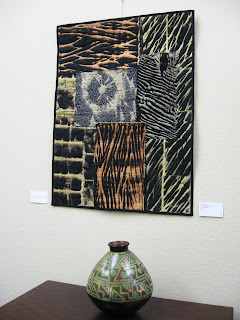 I'm drawn to the desert, and it's interesting that a few of my pieces recently have evoked some aspect of desert life. In considering names for this quilt, I thought about Edward Abbey's Desert Solitaire, an account of his seasons as a ranger at Arches National Park outside Moab, Utah. Abbey reflects on the nature of the Colorado Plateau desert, on the condition of our remaining wilderness, and on the future of a civilization that cannot reconcile itself to living in the natural world. It's a terrific book, highly recommended if you haven't yet read it. I've been thinking a lot about Mexico, too, recently. Possibly my next vacation will be there, but I take them so seldom that I may have to wait a few years! What's most appealing to my psyche right now is dry heat, sand, laying in the sun baking, and the ocean. I'm thinking maybe Puerto Vallerta or someplace else on the west coast. Of course, this mix of components could be found in any number of wonderful places in the world. But Mexico is about all I could afford if I were going to leave the country anytime soon. Instead, though, I am attempting to live my life on permanent vacation while making art!